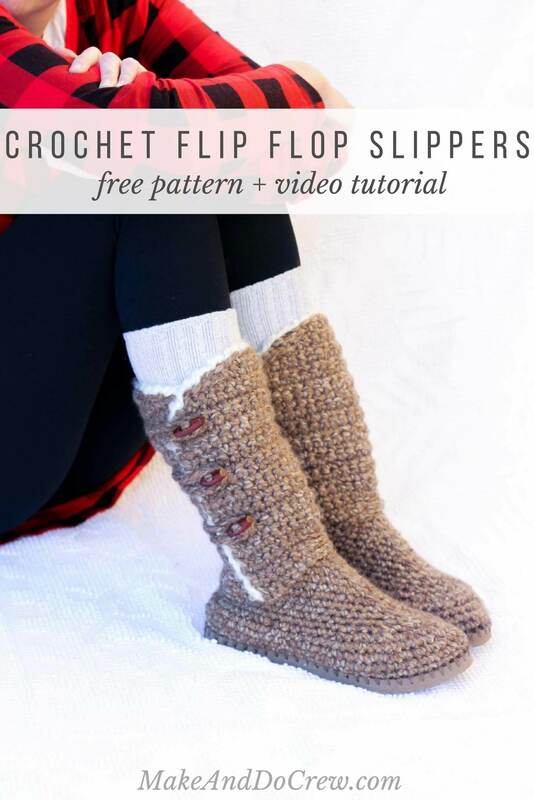 UGG Crochet Sweater Boots with Flip Flop Soles - Free Pattern + Video! 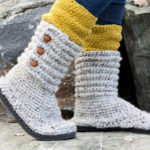 In Part 3 of the free Breckenridge Boots pattern and video tutorial, we’ll add “sheepskin” trim and toggle buttons to finish off our crochet sweater boots. Check out Part 1 and Part 2 of the pattern, or purchase the ad-free, printable PDF of the full pattern for $2.75 here. 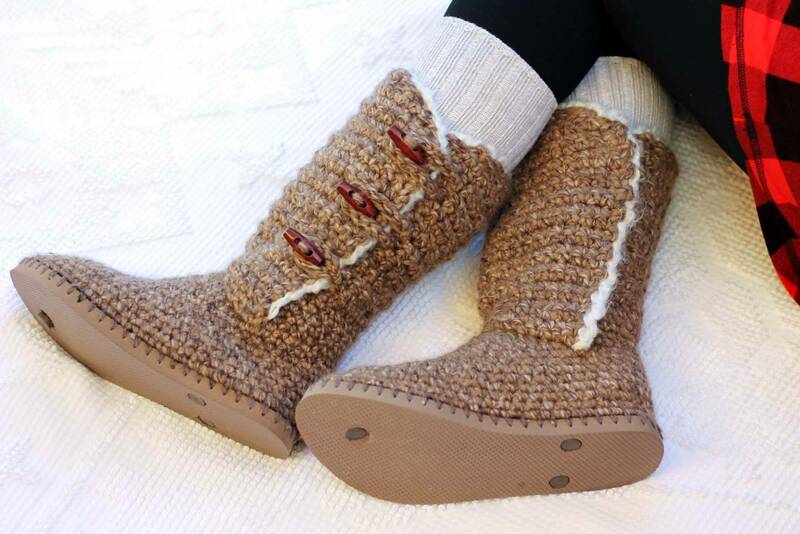 This crochet sweater boots with flip flop soles pattern is a collaboration with my friends at Lion Brand Yarn. This post contains affiliate links. 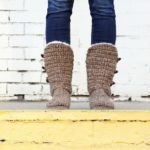 I hope you’ve enjoyed Part 1 and Part 2 of the Breckenridge crochet sweater boots pattern! If you’re here, it means that you’re in the final stretch of boot-making and you’ll have those puppies on your feet in no time. 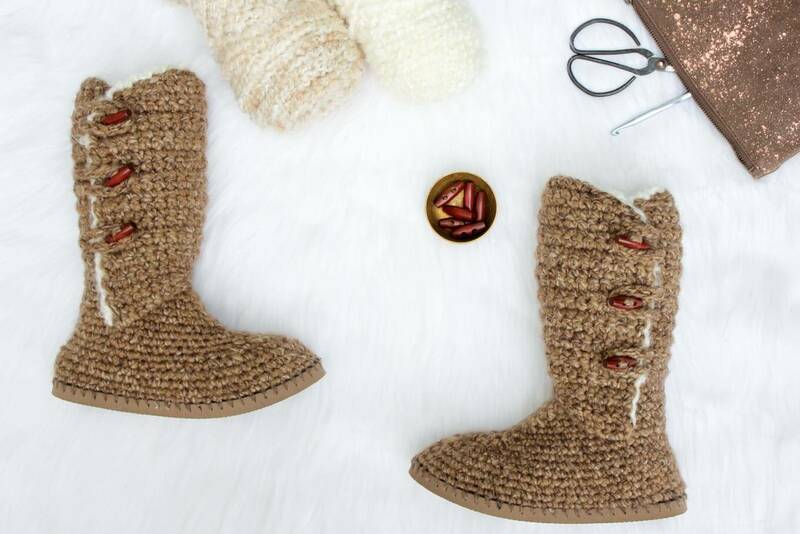 Whether you plan to wear you’re new boots with flip flop soles as slippers or outdoor shoes, adding the faux sheepskin trim and toggle buttons really finishes up the UGG-style look of this free pattern. For the “sheepskin” trim on your crochet sweater boots, you have two great lamb-like color options in Homespun yarn from Lion Brand. While I ultimately used the color Dove for my boots, I wanted to photograph the color Pearl as well just to show you the two colors next to each other. Pearl is on the left and Dove is on the right below. I think either would look really nice as trim and I had a hard time choosing which to use on my boots! Alright, let’s finish off these crochet sweater boots with flip flop soles! As a reminder, you can find the links to Part 1 and 2 of the free written pattern and video tutorial below. And you can purchase the $2.75 printable PDF with the hole-poking guide here. 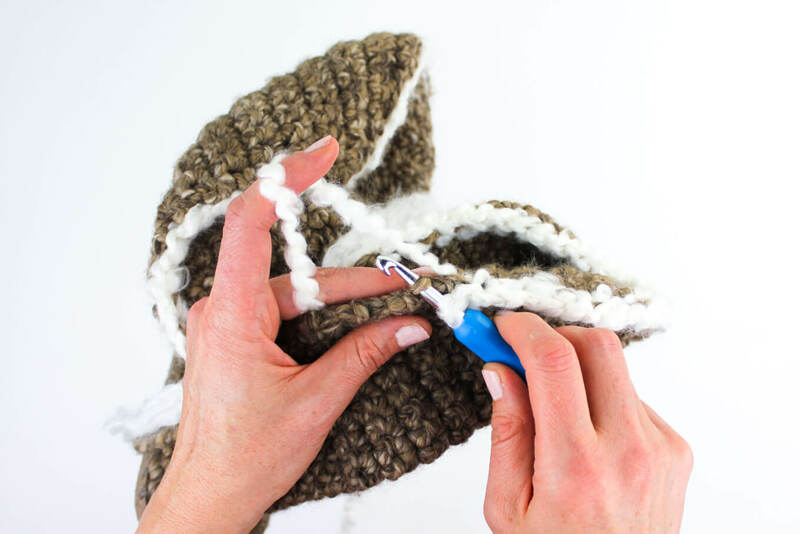 Using largest hook and CC, hold boot with sole facing to the right (to the left for left handed crocheters.) Beginning with slip knot on hook, attach yarn with sl st to inside of front shaft. Continuing to keep RS facing, sl st evenly and loosely around edge of front shaft working into the back (inside) loop of edge. (See photos G and J.) Fasten off. Repeat for other front shaft and both back shafts. Reference video for more detailed instruction on getting your trim to look tidy. Try on boots to adjust for calf size. Use stitch markers to pin flaps into desired position. Sew front shaft to back shaft together at inside of legs, using MC and a basting stitch. Take care to work only on the inside surface of the outer flaps so that your stitches aren’t visible from the outside of the boot. Using MC yarn and a tapestry needle, sew three buttons evenly spaced along outside edge of front shaft, as shown in photo below. Button Loop: With size H hook, ch 12, or a length sufficient to loop around button from back shaft. Fasten off, leaving a 6″ tail. Pull tails on both sides of chain through the back shaft, approximately 1″ from front edge, and knot securely. Repeat with second and third buttons, adjusting length of chains for a custom fit. 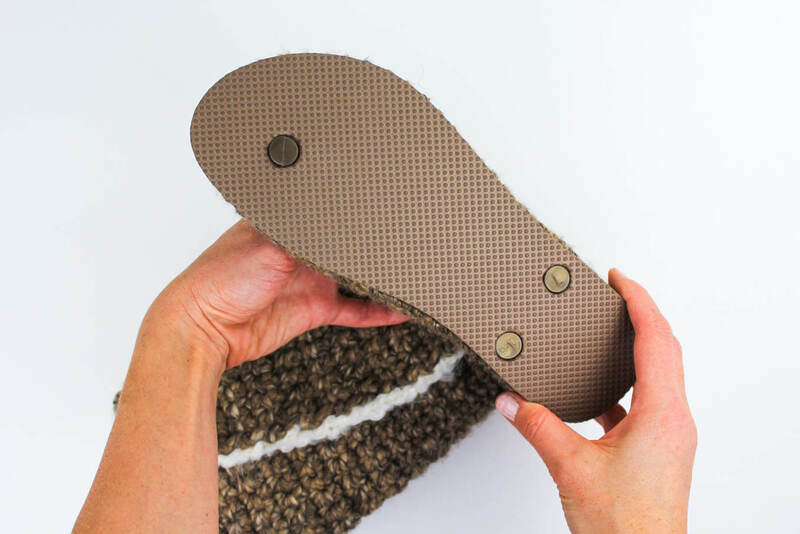 Plugging Flip Flop Holes: If you plan to wear your boots outside, replace the small rubber circle that connected your flip flop straps to the sole between your toes. Glue it in place. See second photo below. In my experience, the other two mid-foot strap plugs stay in place without glue as long as they’re cut at an angle like in the photo below. Fancy Feet: Grab some hot cocoa and put your feet up. 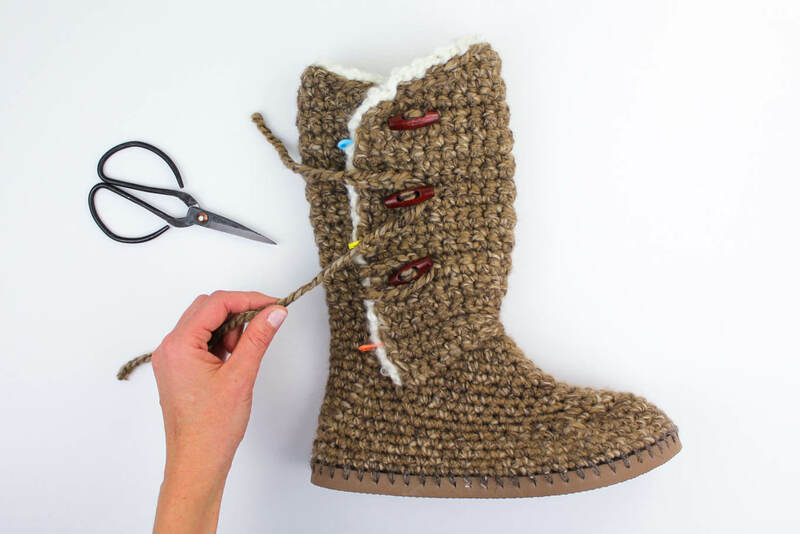 You just crocheted your own boots! 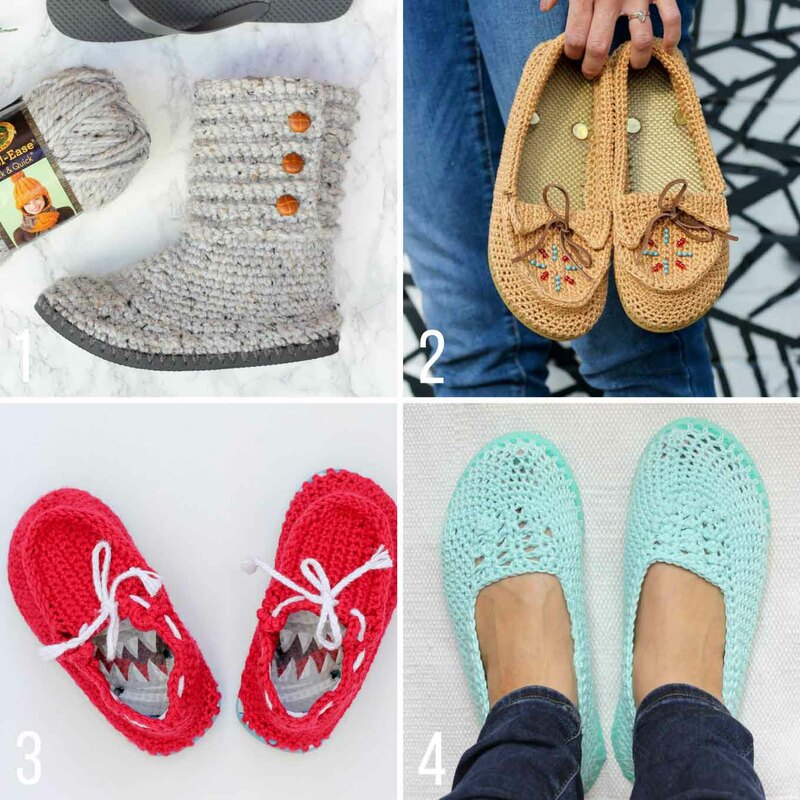 Can’t get enough crochet patterns that use flip flops? Check out my other free patterns! Jess, hi I tried to make your boots. But I keep tearing the flip flop. Can you please tell me what I could being wrong. Ohh boo. 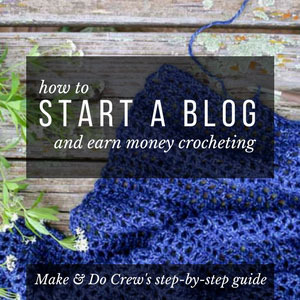 I have answered some questions like this in my FAQs about crocheting on flip flops that might be helpful to you. There doesn’t appear to be a FREE pattern. It’s $2.50.